I don’t know if I’m qualified to write a post about the path to good PR or give good advice based on my experience. I find a lot of where I am and where I came from was unplanned – it’s like my fav band The Avett Brothers say, “All it will take is just one moment and we can say goodbye to how we had it planned.” My path to where I sit now is not textbook or really one that could be duplicated (and if you do, hats off to you – but buckle up, because there’s a lot of twists and turns and highs and lows). I have learned that in this business sometimes the only thing to get you through is a sense of humour, and thankfully mine is intact. So I want to share some of the things that bring a smile to my face — because really, who can’t use a good laugh every now and then? Warning, most of these links are far from being rated PG, cuz that’s the way I roll. Click HERE to see her take on Hollywood’s double standard on older woman, and HERE for athletes who feel their status on the field as entitlement to far more (plus it’s a Friday Night Lights spoof people – clear heads, full wine glasses and Josh Charles…can’t lose). Google her standup. She is a satirical and risque and I love her for it. 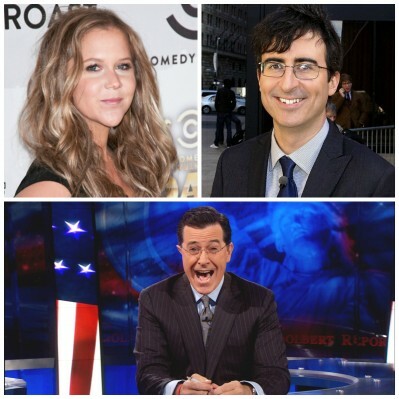 John Oliver – He is well researched, mixes just the right amount of indignation with humour and finishes it all off with more-than-adequate undertones of superiority. He is my new jam – on a weekly basis, I want to know what he ranted about last night. He has skewered everything from The Gap to FIFA to Miss Universe. Would he be just as funny without that English accent? Talk amongst yourselves. A word to the wise, don’t play poker with him, because he will call you on your BS every time. He’s like Goldhawk (google anyone? ), but with way better hair and way funnier – so actually, he’s nothing like Goldhawk. Here is his take on how to make the Supreme Court entertaining. Pure gold. I am surprised this hasn’t been considered by a network because if they have greenlit shows like Honey Boo Boo, The Kardashians and My Strange Addiction, surely this could fly. Let’s rally for pilot season 2016. Stephen Colbert — This video is my go to. When the clouds are looming and I feel like there isn’t a soul in the world who understands me anymore and I just need to remember the good old days when laughter filled my life….then, and only then, I turn to this clip (in truth – it’s usually whenever I can with whomever will listen). I think I have seen it 50 times and I still laugh (out loud). Every.Single.Time. Celebrities Read Mean Tweets – How Kimmel gets them to do this, I will never know … but I am happy he does. There are spinoffs now with Music and Sports ones — even one solely with Obama reading mean Obama tweets. Damn You Autocorrect! – I hate autocorrect. It’s so frustrating and most of the time, I am unsure if the words it substitutes even exist – I somehow feel like it’s Siri’s twisted sense of revenge for asking her to swear — but sometimes, it can be really, really funny. Click HERE, and I dare you not to laugh. Well, there it is – my very first blog post ever. I hope you learned something! I did – I learned that apparently without the internet, I would have nothing to talk about! Thank you worldwide web.